The Cayo District in western Belize, is known for its winding rivers, honeycomb caves, dense rainforest jungle, colorful birds, elusive jaguars, and rich Mennonite farmland. It is also the Mundo Maya, the center of the Maya World. For anyone interested in Maya archaeology and culture…the Cayo is a must see. Whenever my husband Mike, and I visit, we make a point to visit the Maya archaeological sites. Most recently, we visited Xunantunich, one of the most popular Maya sites in Belize. From San Ignacio, the regional main town, it takes 20 to 30 minutes to drive to Xunantunich. A pleasant drive, we passed green, rolling hills, grazing cattle, horses, and bucolic villages nestled between rolling foothills. Arriving at the site, we drove our rental car directly onto the barge that takes visitors across the Mopan River. After disembarking, it was a short drive up the hill to the parking lot and visitor’s center. You can take a group tour, walk the site, or hire a guide. We chose to hire one of the guides, for $30. Xunantunich sits on a ridge, above the Mopan River, near the village of Succotz. As we walked up the trail, towards the main plaza, the guide described our surroundings, stopping to point at the tree tops. Looking up, we spotted several howler monkeys napping in the upper limbs. Our guide told us how “Xunantunich” acquired its name. In the Yucatec Maya language, Xunantunich means “Stone Woman”, or maiden of the rock. In the late 1800s locals reported spotting a beautiful Maya maiden, wearing a traditional huipil dress, roaming the site. They said she was dressed in white with fire-red eyes. She appeared in front of the El Castillo palace, stood outside the mouth of a cave that extended beneath the structure, then disappeared… It’s said, her spirit inhabits the site to this day. Once we reached the plaza, El Castillo, the grand palace of Xunantunich stood to our left. The plaza was green and lush, surrounded by tall coconut palms and indigenous trees. Such an incredibly beautiful site. 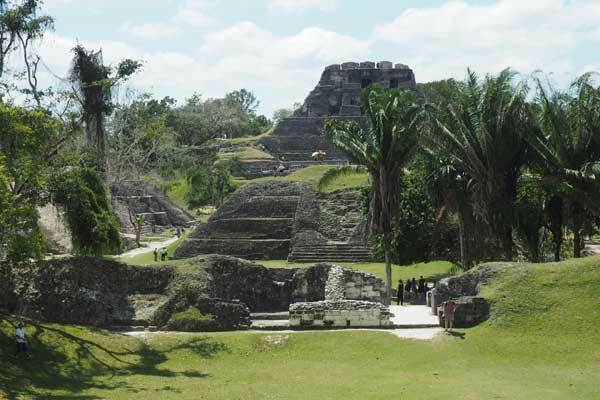 Xunantunich was first settled during the Middle Pre-Classic Maya period (1000 BC to 400 BC). The structures at Xunantunich were built over 1,300 years ago. It’s inspiring to learn how much the Maya accomplished, so long ago. At its peak, up to 1 million Maya inhabited the area that’s now Belize, triple the current population. After 900 AD however, the entire Maya civilization declined and major cities were abandoned. 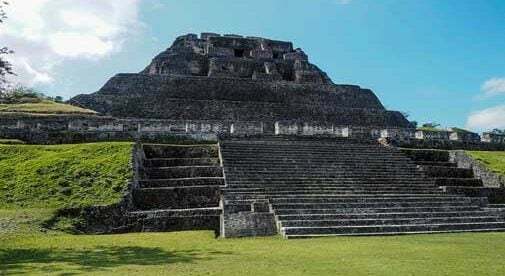 Xunantunich outlasted other Maya cities. But by 1,000 AD it too was abandoned. No one knows what caused the decline of this amazing civilization and it remains and unsolved mystery. 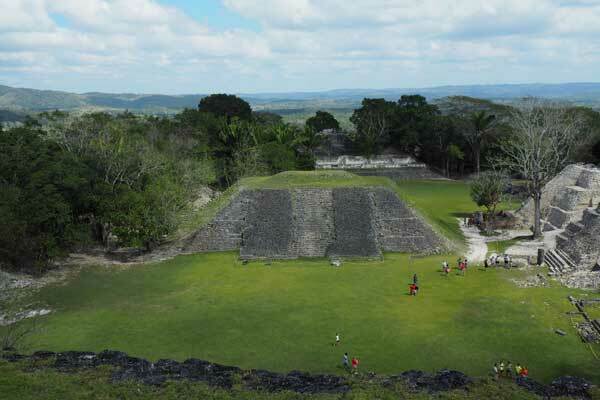 Xunantunich extends over a square mile, including six plazas with more than 26 temples. It took us two hours to explore the main areas, with our guide describing each one and its history. We spent quite a bit of time at El Castillo, exploring the grand pyramid and temple. At 130 feet tall, El Castillo is the second tallest structure in Belize. It was built on the site’s “axis mundi”…a vertical line the Maya believe connects the earthly and subterranean realms with the heavenly realms. Climbing the series of steps that lead to the El Castillo’s pinnacle, , I was rewarded with a 360-degree bird’s eye view of the Cayo District…a stunning feast for the eyes. Looking towards the east, the lush, green foothills and pastures of the Cayo, roll out towards San Ignacio Town. Towards the west, you can see Benque Viejo del Carmen, a traditional Belizean town on the Guatemala border. Beyond the border is the rugged terrain of Guatemala and the town of Melchior. Since 1990, several archaeologists have conducted excavations at Xunantunich. They have found a significant plaster frieze that once encircled the El Castillo structure. It depicts the birth of a god associated with the royal family, as well as the tree of life that connects the underworld, the earth, and the heavens. Fortunately, the friezes on the west side of El Castillo have been restored. So, we were able to imagine just how grand the original artistic creation was. You can easily reach Xunantunich by bus, rental car, or taxi. The small ferry will transport you (and your car) across the Mopan River. It runs from 7:30 a.m. to 4 p.m. It’s a mile uphill to the park entrance and visitor’s center. Most visitors take a tourist bus, car, or taxi to the visitor’s center, rather than walk. The entrance fee is $5 and historical information is available at the visitor’s center. You can hire a personal guide, as we did, and tour the site at your own speed. Or you can wander the site alone. Arrive early if you’d like to avoid the midday heat.